A Professional Home Organizer is someone that helps you to overcome clutter and disorganization to make your life, less stressful and your time, more efficient. We are your confidante, your advisor, your design and decluttering expert! A Professional Home Organizer not only helps you organize your home, but they also create easy-to-follow systems to help keep it that way. They are there to help you through the entire process or if you choose, to get down and dirty and do everything themselves. They are there to sift, sort, clean, file, de-clutter, de-stress and design to help make your home a better place to live. They are passionate about helping others and their purpose is to make you feel happier, organized and stress-free! With Jennifer's degree in Interior Design and extensive experience in retail, we know she will be able to help you solve all your home interior problems. Read more about Jennifer's background on our Bio page. What aren’t the benefits is the real question? How nice would it be to not be staring at your closet for 15 minutes wondering where you put your favorite top? How about the time wasted putting back all the stuff that just fell out of your cabinets when you opened the door? Being organized will give you additional time to do the things you want to do. Your home should be your happy place…you should be enjoying your time in it, not stressing over it! We are happy to help you in almost any area in your home. From the basement to the attic and everything in between, D'Clutter Design can help. No area is too big or too small! Take a look at the D'Cluttered Spaces page to see some of our work. Review our Services page and fill out our Contact sheet to get started. Do we work together or do you work alone? Our preference is for us to work together with you as a team. By working together, we will be able to discuss if you want to purge any items, have a better understanding of the systems and spaces we create and help the project move more smoothly. If you prefer not to be part of the process, that’s fine. We can have periodic touch bases to discuss any concerns or questions we have during the project. Simply give us a call or contact us here and tell us why you are seeking our services, what rooms/areas you’d like organized, and any other details you’d like to include. We will contact you within 24-48 hours to discuss your project and set-up a time for your in-home consultation. After our initial phone conversation, Jennifer would come to your home and have you walk her through your spaces. We would then discuss your concerns, what you would like to see change and what is currently working for you. PLEASE – we request that you do not clean up prior to our meeting. We know it can be uncomfortable to have a stranger come into your home, if you “tidy up” we won’t be able to truly understand or solve your problems. That decision will be up to you. Depending on the type of project, your design vision and budget will determine what supplies we will want to purchase. On our first working appointment, we'd ask that you have large garbage bags for anything we decide to purge. When possible, we love to use supplies that clients already own. You’d be surprised to see what can be used as a container. If we find our best solution is to purchase additional items, we will develop the list together. You can choose to purchase them on your own, plan a shopping trip with us or we can purchase the items for you. Of course! Since we prefer to work together, we will work to find a time/schedule that works best for you. 100% confidential! It is not easy to ask for help and D'Clutter Design appreciates you choosing us to confide in. All meetings, conversations, and questions are between us and no one else. Please take a moment to read our Bio page. Hopefully, you will get a sense of the kind of company we are and that our main goal is to make you feel comfortable. Please visit the Services page for an overview of our service fees. For a full description of our fees, please give us a call or fill out our Contact sheet and we will be happy to discuss our fee structure during our consultation. Not a problem! We require a minimum of 4 hours for our services. Each project will have a different time frame and we can give you an estimate of hours at our consultation. We also offer our clients a D.I.Y. package to supply them with a plan of action and suggestions of storage products so they can tackle their jobs on their own. Please review our Services page for more details. Currently, we accept cash or checks. Payment is due at the end of each work session (each day). 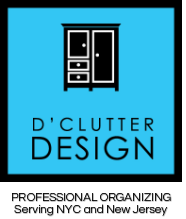 If you have additional questions about D’Clutter Design’s services, please reach out.